Summer is not totally over yet, so I am making you a Mango and Black Bean Quinoa Salad. I just love salads. Last month when I went home to Boston, my stepmom made this awesome pasta salad with mangoes, black beans, corn, pasta, cilantro and lime. I really enjoyed it, so I decided to come home and make a twist on that recipe. I used quinoa in place of the pasta, since I am not a huge pasta fan. I think this came out really good! This would be perfect for parties and it’s also very easy to make. 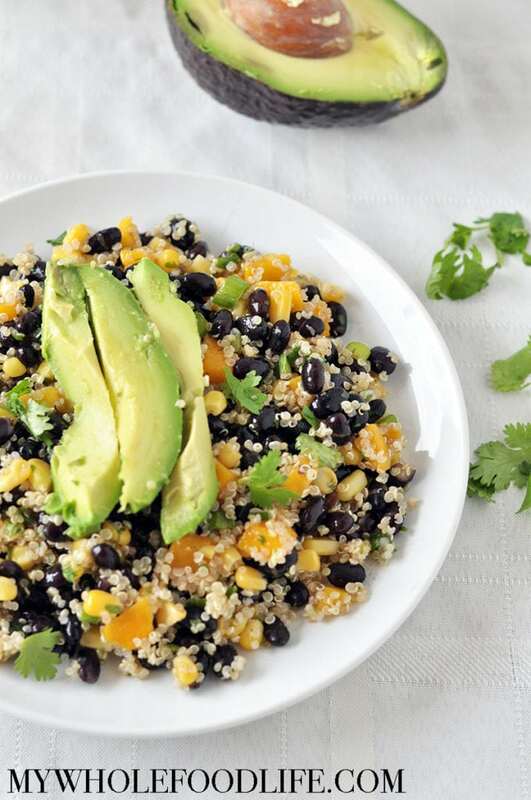 This Mango and Black Bean Quinoa Salad is vegan and gluten free. I highly recommend topping it with avocado. So good! We shot a short video for this recipe. You can view it below. For more videos, you can subscribe to my You Tube Channel. The perfect summer salad! Vegan and gluten free. Mix all the ingredients in a large bowl and place in the fridge for 30 minutes so the flavors can marinate. This should keep for at least 3-4 days in the fridge. Enjoy! Just made this and even before marinating in fridge for 30 minutes, it's so tasty!!! What a nice light dinner- I did add a splash of olive oil, just to give it a little more depth.. Thank you! You are so welcome! Glad you liked it! How much is 1 T? Not sure I get that measure. Soooo my salad is dry...like not enough dressing. I wonder if my mangos aren't ripe enough? ?